As the sun tinges the landscape golden late in the afternoon we rumble over some roots and rocks on a narrow path towards Eagles Rock in Mashatu, Botswana. 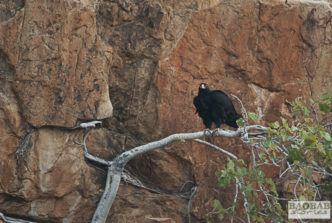 From far we see the rock glowing in the red light with one of the resident Verreaux’s eagles circling high above it. The air vibrates with the sounds of the African bush. On our right we pass the impressive site of Mmamagwa, an old prehistoric area radiating a mesmerizing atmosphere. 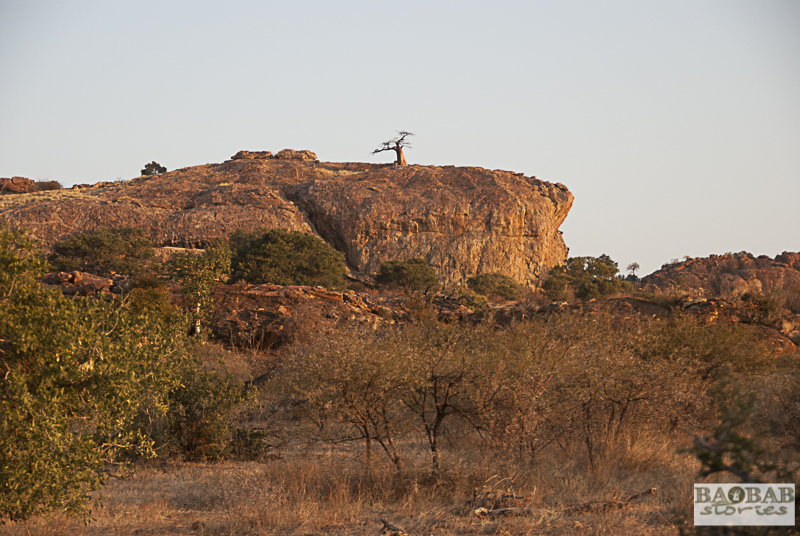 Just on top of the enormous boulder grows a solitary baobab quite visible from far. In its daily quest it seems to stretch out two major branches like arms towards the sky – almost as if to shout “you up there – can you see me?” The tree is known as Rhodes Baobab although it has existed long before Rhodes had set his foot on this magical place. A little while later we pass a startled looking zebra we obviously disturbed in its early evening routine. Russell Crossey, our field guide of the day, negotiates his way around some shrubs and stops our 4×4 nearby an impressive rock formation called Eagles Rock. We face the rocks just underneath a large-leafed rock fig growing out of a crack. The engine dies with a low rumble. A soft wind touches our faces and evenly distributes the dust we have just stirred up. The heat of the day is a mere memory. 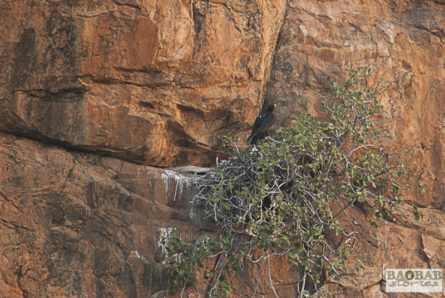 On a second glance up the rock we discover the eagle’s nest perfectly embedded on top of the branches of the fig. The chick has recently hatched and we are lucky to catch a glimpse of it. Both parents are out to hunt and circle above us. 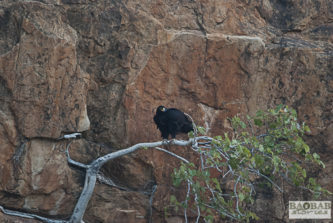 Their preferred meal are rock dassies which are aplenty in the area. „It actually goes back to a time when I was about 10 years old. Like most South Africans I liked rugby which does not come as a surprise as South Africa is a great rugby country. On the Springbok team was a famous rugby player called Ian McCallum. He was one of the hardest tacklers in the rugby game and even the toughest players respected him. Besides playing rugby he was a well-respected psychiatrist in Cape Town. At one point in his career McCallum decided to take a year’s sabbatical. 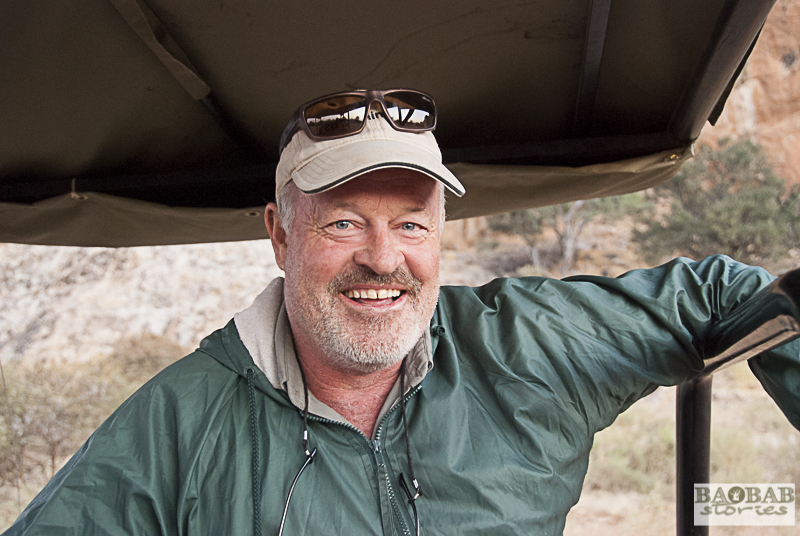 He and his wife moved to Linyanti in the Chobe region of Botswana to manage a little camp for Wilderness Safaris. I was working in the same concession in a camp called Kings Pool and I had heard of him working close by. One day one of the camp managers asked me if I could go to Linyanti to drop off some things. I was more than happy because I got the opportunity to meet my childhood hero. I drove to the camp feeling a little bit nervous and in my mind expecting this amazing rugby player being a really tough, hard guy. When I got there and finally met him I was startled – he turned out to be the most gentle, soft spoken and sensitive person you can imagine – and a poet really sensitive to nature and well-tuned into this Linyanti area. While we talked he revealed that he did not write the poems so much as the poems wrote him. He would be sitting somewhere looking at something and suddenly the words would come to him. He realized that poetry is the only way you can describe some of these incredibly sensitive things. One of the reasons being that poetry verges on the imagination, the subconscious and the collective unconscious and it is a great way to describe certain events that are too beautiful to use normal words for. He found that poetry was the best way for him to express himself. 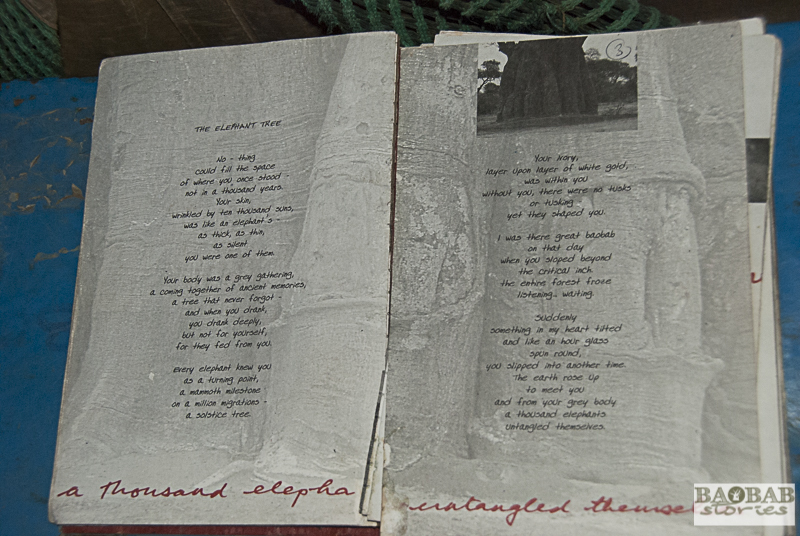 He wrote a book of poetry which is one of my favourite books (I have no doubts about that because Russell takes a well-used copy of the book out of the glovebox of the car) and in it one of the many poems is about the baobab tree. It fascinates me how the story he shares of the baobab is intertwined with his life. 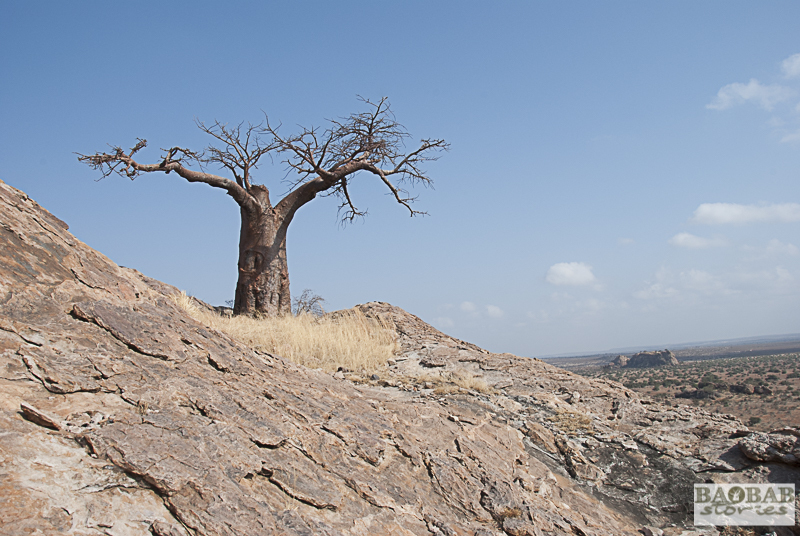 At Linyanti there was an enormous baobab tree which McCallum loved to visit and sit next to at sundown. He called the tree the „old lady“. 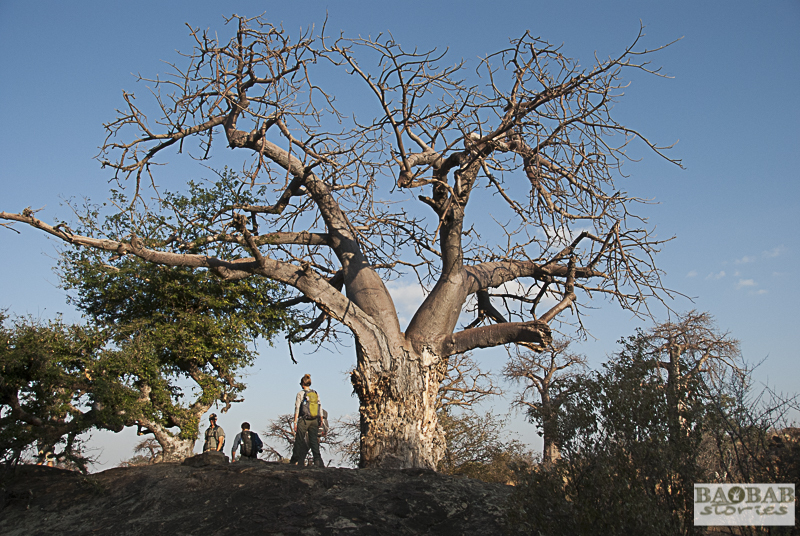 The baobab was severely damaged by elephants – for decades they had been eating off it. They came and tusked bark out in a way that gave the tree the shape of an hourglass over time“. Russell interrupts his story to explain that other trees run conductive tissue through the bark in which they transport nutrients and water from the roots to the treetop. If they happen to be ringbarked, their supply chain gets interrupted and the trees die. The baobab is different. According to Russell „the whole tree is a conductive tissue and it therefore resembles a big root“. Taking bark off in a circle does affect the baobab but it does not die from it. Even if it is severely damaged it still has got conductive tissue inside. 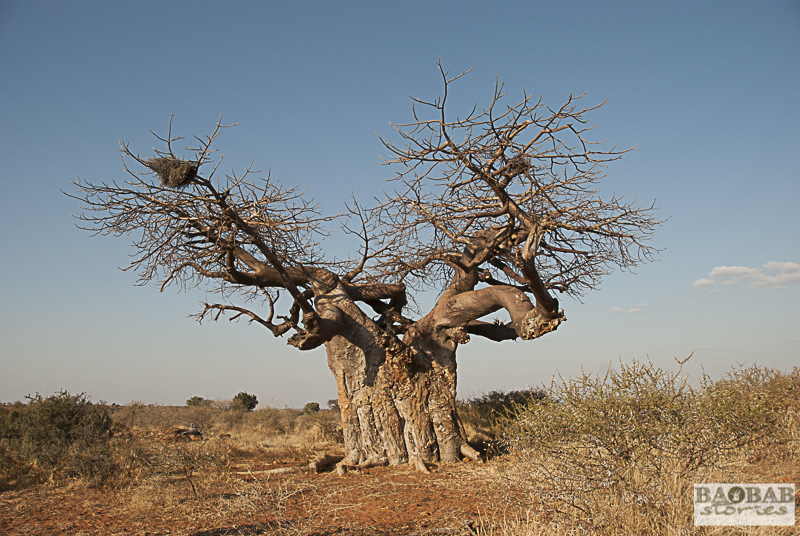 „The baobab at Linyanti had been hit hard by elephants from two sides. Eventually gravity played its part and one night the tree crushed into the ground. That same night one of McCallum’s friends and mentor whom he was very close to, Vera Burman, a senior psychiatrist, died as well. She had had a vast impact on his life and career. 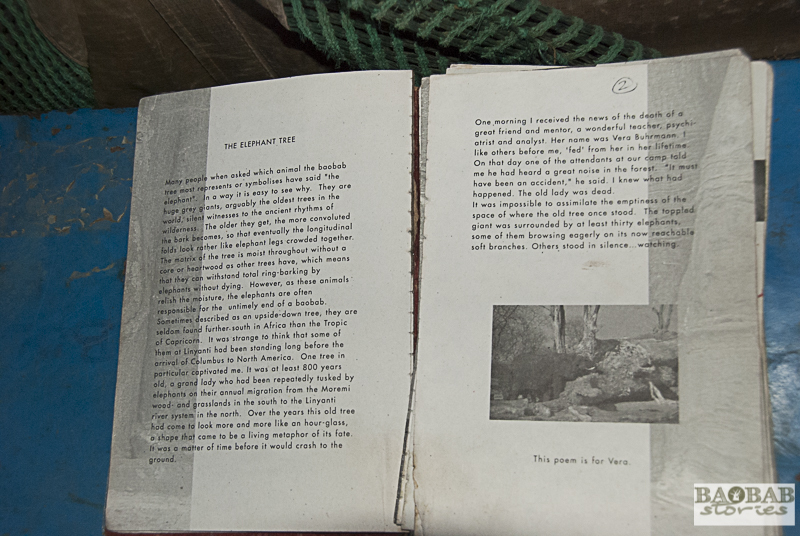 McCallum sat down and wrote a poem which combines the life of the old tree with his mentor – the poem is called „The Elephant Tree“. The book gives a little introduction to the poem explaining the context“. What happens next makes goose bumps running down my spine: Russell reads the poem out loud with his clear and smooth voice. Each word echoes from the rocks to the sounds of a francolin calling nearby. The eagles are still circling above us. The poem ends and we all sit in silence while the echoes slowly fade into the sounds of the bush. I am grateful for these enchanting moments and I am glad I had asked Russell to share his baobab story with me. 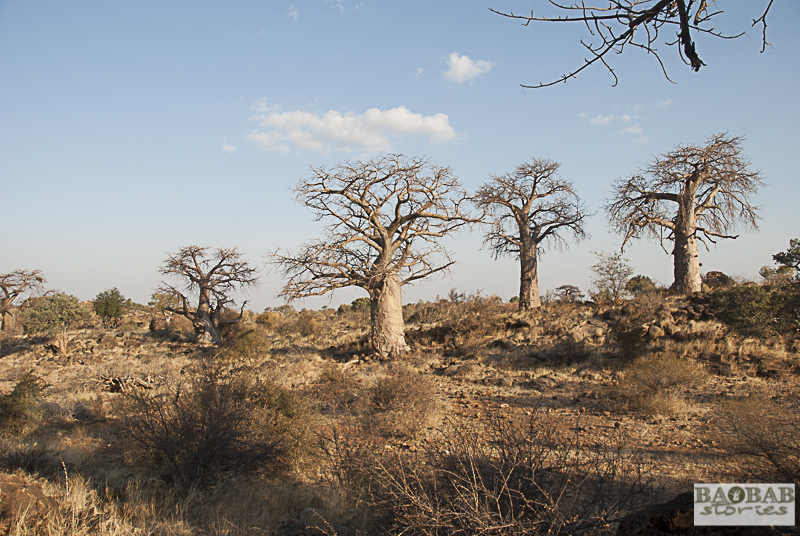 While I participate in a Trails Guide Course with EcoTraining at Mashatu in Botswana I have plenty of opportunities to see some of the incredible baobabs. 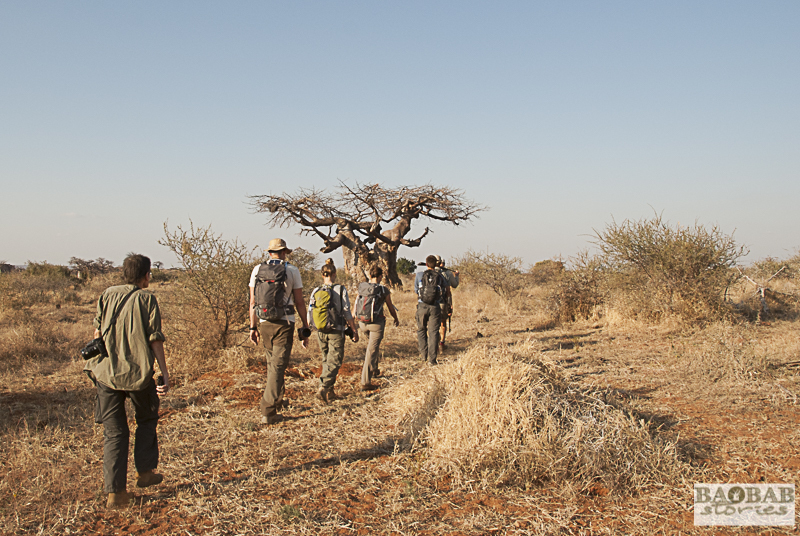 On another occasion Russell takes us out on a memorable walk up baobab alley. 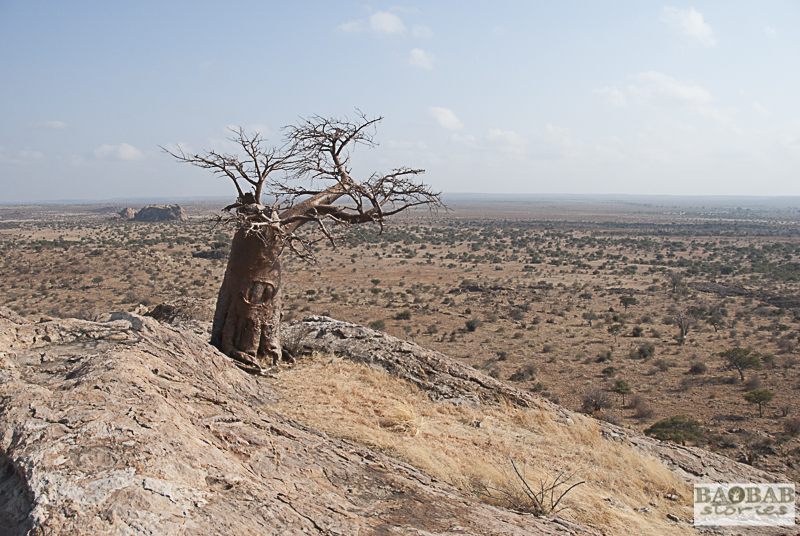 It is close to Mmamagwa and at least as stunning as the place with the exposed baobab. What a luxury it is to live in such a magical baobab place. This entry was posted in Baobab_Location, BaobabFriends, Stories, Travel and tagged Baobab, Baobab Alley, Botswana, Ian McCallum, Mashatu, Mmamagwa, Rhodes Baobab, Russell Crossey by Heike Pander. Bookmark the permalink.